The exterior of the historic Prince of Wales Hotel in the town of Niagara on the Lake in Ontario, Canada is surrounded by blossoming spring flowers. Pink flowers hang from the the trees while radiant colored tulips decorate the gardens. The architecture of the hotel is done in a Victorian style with stunning antique furnishings and traditional woven brocades adorning the walls. While staying at this hotel, you can be assured of fantastic service and treated with great respect from the staff at the Prince of Wales Hotel. Along the quaint streets in Niagara-on-the-Lake, tourists can take a horse and buggy ride where the history of the buildings and town is fully explained by the coachman. 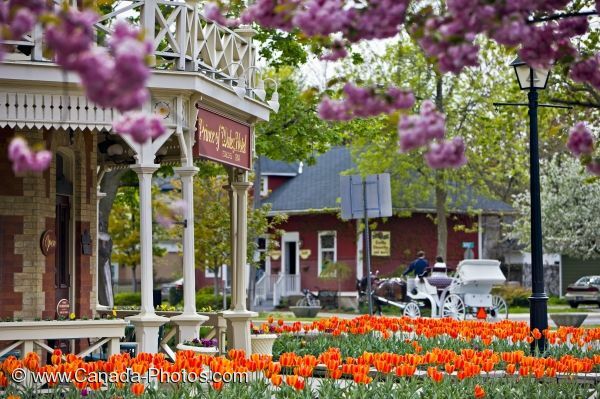 This pretty little town is beautiful to see at any time of year, but the spring flowers add prominent color to the area. Photo of the blossoming spring flowers outside a historic hotel in the town of Niagara-on-the-Lake in Ontario, Canada.